Why Upgrade to Urethane from Rubber Tires? The saw blades for all band saws sit on rubber or Urethane Tires. 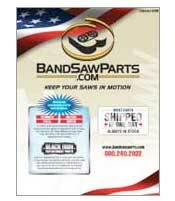 The purpose of the band saw tires is to improve the proper performance of your band saw . Of course, band saw tires will need to be changed periodically . We often see this as well as the chip brush, as maintenance which is often forgotten – often until performance is negatively impacted. So, it is necessary to replace worn out tires to keep the machine in proper working order. If you want to realize better results, performance and to stop from having to use messy adhesives that are used with rubber tires, then you should consider upgrading to Urethane band saw tires. Here are some reasons why you might consider upgrading to urethane tires. First, the use of Urethane Tires over Rubber ttes is becoming more standard and recommended for the following reasons It improves your saw with parts that makes the band saw blade lasts longer and cut straighter. In addition, the tire provides for a smoother operation. Blade alignment is easier with the Urethane Tires as well. Second, Urethane Tires easily fit onto the wheels. After soaking in a hot water for a few minutes, it makes installation easier, making it more convenient for you compared when you install a rubber tire on the wheels. You can even use only one hand when you install it! Thirdly and along the same lines, Urethane Tires are becoming more in demand due to the fact that they are easily replaced and do not require glue to install. The adhesive that is used on old rubber tires would takes your time in just removing/ cleaning the wheel itself. Urethane Tires do not need any adhesive during installation, therefore, you can save time, money and your effort. And lastly, Urethane Tires last longer and work far better than rubber tires. Moreover, it is durable and will not wear out and become brittle as quickly as rubber tires do. Also, they come with a crown which allows the blade to track better on it. You will absolutely see the difference in the performance of your band saw when you upgrade to Urethane Tires – band saws work better with a good tires in place. Urethane certainly seems to be a better investment. 7/8" wide by 3/32" thick. The Ultra Blue Urethane Tires provide even greater durability and resistance to damage and allow for optimum blade tracking. These tires provide superior strength and are generally installed without adhesive bonding being required. Simplified installation procedures permit the saw to be returned to service sooner after installation. All tires are sold as single tires and prices are per tire. 1 1/2" wide by 3/32" thick. The Ultra Blue Urethane Tires provide even greater durability and resistance to damage and allow for optimum blade tracking. These tires provide superior strength and are generally installed without adhesive bonding being required. Simplified installation procedures permit the saw to be returned to service sooner after installation. All tires are sold as single tires and prices are per tire.